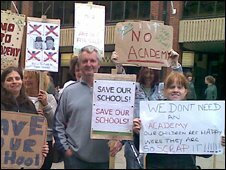 Campaigners opposed to plans to replace three Cumbrian schools with an academy have held another demonstration. About 150 people gathered outside Barrow Town Hall on Friday evening for the latest in a series of protests. Opponents have argued that the move is disruptive to education and has left some teachers uncertain about jobs. The academy's management said it was listening to parents' concerns. Cumbria County Council said the move would transform education in the town. The academy was approved in January and is due to open in September. It will replace Parkview, Thorncliffe and Alfred Barrow secondary schools and be based on the Thorncliffe and Parkview sites. The academy is being sponsored by Furness College, the University of Cumbria and Barrow Sixth Form College. Helen Irving from the Barrow parents' action group said: "Our children have rights and we can stop this because we can refuse to be involved with it, refuse to buy the uniform and basically refuse to enter into any of the exercises that they are putting through as academy events. "Our children still go to Parkview, Alfred Barrow and Thorncliffe schools." Cumbria County Council has said the academy will be a "real opportunity to bring in a lot of resources to transform education in Barrow".